Donald Margulies’ latest drama Time Stands Still, now on stage at the Geffen Playhouse in Westwood, may be the perfect play for these recessionary times. At least in the sense that, it’s the kind of thing you might find on a cable television station without having to pay for any premium services. It’s very familiar territory, a relationship story about a couple - James, a journalist, and Sarah a photographer - who have just returned after a traumatic tour in Iraq, and are now dealing with the physical and personal ramifications. These struggles are contrasted against the personal developments between their older editor and his new, younger, and much less politically inclined love interest. This is territory that Margulies has proven himself a master of in previous outings like Sight Unseen. You can pretty much see everything coming in Time Stands Still– the ethics of photojournalism, the insightful deconstruction of liberal guilt, and all of the how-can-we-go-on melodrama. Unfortunately, it's not nearly as engrossing or moving as any of the war zone photographs implied in the title. It’s mildly funny, and professionally done, however. Especially when Mandy, the editor’s new paramour, turns her apparent ditziness into biting critiques of everyone’s endless whining. This part is typically played by Alicia Silverstone who was absent during the performance I attended, but I certainly didn’t notice, given the incredible quality of the one given by Monica McCarthy, her understudy. All of the actors benefited from Daniel Sullivan's competent and focused direction in often stiff scenarios. Ironically, perhaps the thing that struck me most about the play is the setting – an apartment in Williamsburg, Brooklyn that the characters occupied “before it was cool.” Needless to say these characters are exactly the people Danny Hoch holds up to criticism in his recent Taking Over seen here in L.A. last month. Sarah is confronted with the moral ambiguity inherent in her work when an encounter photographing female prison inmates during her recovery recalls prior confrontations by Iraqi bombing victims. With all of Margulies exploration of the problematic nature of his characters' interest in conflicts that are not their own, he feels the need to send Sarah to a nearby prison to discover the war at home when in reality it's right outside her front door. In fairness, though, this is a play not about gentrification, but about love. Unfortunately, that maybe its primary problem. I know I’ve said it before, but it bears repeating with less adornment. The heir to Esa-Pekka Salonen as the leader of all things musical in Los Angeles is not in fact Gustavo Dudamel. (At least not yet.) No, the person who has more or less already assumed that mantle is none other than James Conlon, the current music director at Los Angeles Opera who is on another hot streak in town this spring where he, not unlike Savoir Faire, is everywhere. He just opened up an outstanding production of Das Rheingold last weekend as the kick off for the city’s massive Ring cycle next year. In April, he’ll follow that up with Die Walküre and Braunfel’s Die Vogel. 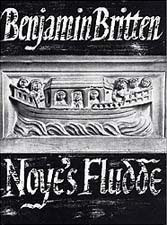 Next weekend he’ll lead two free encore performances of Britten’s Noye’s Fludde at Our Lady of the Angeles Cathedral downtown. (Forget it. The free tickets are already long gone.) And in between all this, he’s on the podium this weekend over at Walt Disney Concert Hall with the Los Angeles Philharmonic. What can’t the man do? Last season we had a splendid program of Tchaikovsky and Shostakovich and this year it’s more Mendelssohn than you can shake a stick at. Yes, Yes, it’s the whole anniversary business. And do we really need to hear the Midsummer Night’s Dream stuff again? But Conlon does not mess around and gave really sharp, brisk and urgent readings of the works on offer. 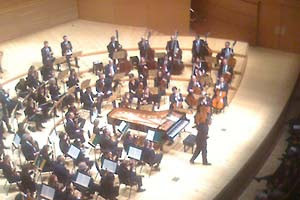 At the opening was Mendelssohn’s First Symphony, a work never before performed by the L.A. Philharmonic, as Conlon himself acknowledged in comments from the stage, noting he never hears the piece except when he’s conducting it. It’s the work of a 15 year old prodigy who was sadly already at middle age unbeknown to him. Still, the symphony is informed by his predecessors and Conlon made a best case argument for its very classical style. In between this and the inevitable wedding music, was the ubiquitous violin concerto with the even more ubiquitous Sarah Chang as soloist. She’s an attraction I suppose, but not one for me. She stomped her way through Bruch's violin concerto last year to little payoff. This time around a red fishtail frock managed to tone down the floor show, but there was still plenty of contortion to go around. With all of the action, I was waiting for her to take flight, but no such luck. Her Mendelssohn was decidedly earth bound despite the histrionics. But we still had Conlon, and the city would be poorer without him. While I haven’t yet seen the new Das Rheingold at LA Opera (that will have to wait until Wednesday this week), I did have a weekend filled with music from a variety of other notable ensembles reminding us that Wagner was not the only game in town. 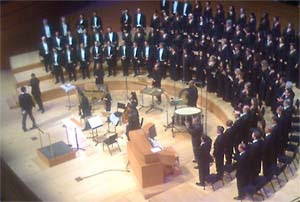 Probably the highlight of the weekend was the latest Los Angeles Master Chorale show. Who knows what the theme was – there seemed to be hundreds of them. The show was billed as “Chorus + Organ” and many of the pieces did involve at least some cursory organ accompaniment from Christopher Bull. But just as much of the music on the bill didn't. There was also a good bit of new and very recent music, and director Grant Gershon bandied about some banalities about “darkness and light.” You can take your pick, but the program showed off what I love best about the chorale, superb musicianship and a serious interest in contemporary compositions. To start, though, was some not-so-contemporary stuff from Arvo Pärt, Brahms, and a pair of motets from Anton Bruckner. Yes, I never though I’d see the name Bruckner so close to the word “motets” either but there they were in all their romantic German glory and they were likely the highlight of the whole evening. Offset against these works were two world premieres – Andrea Clearfield’s Dream Variations and Steven Sametz' Music’s Music. The former was a movie-music sounding setting of Langston Hughes poems commissioned with the Debussy Trio in mind that was rather forgettable. The Sametz piece, was a commission from retiring LAMC friend and administrator Kathie Freeman taking a text from a poem written by her daughter at the composer's suggestion. It was very pretty with a substantial solo part for mezzo Erica Brookhyser and clearly meant a lot to everyone in the organization. Probably the musical stand-out among the newer works, however, was Nico Muhly’s Expecting the Main things from You, a setting of poems by Walt Whitman. While Muhly’s piece was the most substantial, it was also the most recognizably derivative from recent forebearers like John Adams and Steve Reich. But if you’re going to borrow, borrow from the best I always say. Above it all, though, was our wonderful local chorale. Subscriptions have gone on sale for the LAMC 09/10 season featuring choruses from The Death of Klinghoffer, Bach’s St. Matthew’s Passion, a new work form Meredith Monk, Pärt, Americana, and more recent work than you can shake a stick at. Prior to this show, I caught Sunday’s matinee performance from the L.A. Philharmonic conducted by the piano soloists and friend of the L.A. Phil, Christian Zacharias. Shows under his guidance are usually warm and engaging, and this was no exception, although things fared much better when he was playing than just conducting. There were rather lukewarm performances of Brahm’s Serenade No. 2, and Haydn’s sinfonia concertante in the first half of the program. But the real prize was Schumann’s Piano Concerto in A minor. Zacharias switched from the mechanical to the exuberant with this work, giving a gorgeous, unfussy performance. Not a program for the record books perhaps, but no slouch either. Meanwhile, UCLA Live offered up a performance from the touring Munich Symphony Orchestra on Saturday under the direction of piano soloist Philippe Entremont. More German romantics were in the offing starting with Wagner’s Siegfried Idyll and the first Beethoven Piano Concerto. Both were accurate and engaged, but often overly plodding and deliberate, I felt. Entremont played with a sharp clarity, but it seemed a little on the careful and predictable side. There’s pretty and then there’s slow if you know what I mean. Things picked up after the break with Webern’s Fünf Sätze, and Mendelssohn’s Fourth Symphony. The zip was back at this point with taut, energetic attacks. San Diego Opera is currently providing a rare opportunity to see Massenet’s Don Quichotte, an opera deserving of more attention than it is usually afforded. It’s a treat to hear, especially considering that under the right conditions it could be as easily entertaining as Verdi’s Falstaff. And while, sadly, these are not quite such circumstances; there are some things worth seeing. 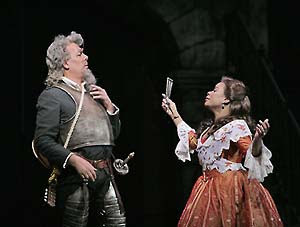 First and foremost is bass Ferruccio Furlanetto. He’s a longtime friend of this company, and this production was staged more or less exclusively for him. And why not? He’s great, infusing Cervantes’ hero with real humor and pathos. To make the situation even better, he’s abetted by Eduardo Chama in the role of Sancho Panza. Chama is solid throughout and works well here with one of the biggest stars of the operatic stage. The San Diego Symphony Orchestra was in the pit under Karen Keltner who fared well even if it wasn’t the most French sound one could imagine. However, Massenet and Furlanetto are not alone in this endeavor, but little else lives up to their standard. Company General Director Ian Campbell directs this rather pedestrian staging, which appears to at least have the benefit of being non-descript enough to stand in for about two dozen other operas with little more than a costume change. It's a brand new production, but you wouldn't know that to look at it. The lighting was quite good, however, with Marie Barrett turning some minimal moments into far more enticing propositions including the windmill scene. The chorus sounded fine, but could have used a little more stage direction. The bitterest pill, though, was Denyce Graves as Dulcinea. Graves gives her character a worldliness, but vocally things are far too out of control for her at this point to manage this role. It was a white-knuckle performance – and not in a good sense. Still, for San Diego to put time and effort into something a little off the beaten path these days is admirable. You’re not going to hear this work again soon, especially given the unfairly bad rap French opera gets in this country. There is one more performance on Sunday the 22nd. Just when you think you’ve been there and done that…. I’ve heard Cecilia Bartoli a number of times before, but then you walk into a concert like Tuesday’s in Orange County and it hits you like a brick wall. Christ can she sing. What else is there to say. This tour is in support of her recording-come-homage to 19th century mezzo Maria Malibran. The show, unsurprisingly, consisted almost entirely of songs from Bellini, Donizetti, and Rossini and while these may not be the most important works she’s ever sung, you wouldn’t have known that from the way she presented them. Absolutely frigging brilliant. That's really all I have to say. It’s raining and relatively cold on this President’s Day in L.A., but despite these inclement conditions a SOLD OUT crowd showed up at the Zipper Concert Hall downtown for one incredible program from the Monday Evening Concerts Series. The occasion was appearances from two local favorite ensembles, red fish blue fish and the Argento Chamber Ensemble in an evening of works by Gérard Grisey. Argento was also involved in last year's fantastic Helmut Lachenmann prgram, so perhaps it's no wonder that there would be such a crowd. Say what you will about Angelenos, but we love our spectralist composers. I mean really, who knew? But there the organizers were, holding up the start of the show trying to put every last person they could in a seat before turning people away. This delay proved to be the only negative moment in the show as it forced me to continue to hear the inane grad-student conversation about theory (non-musical) and such from the well-meaning but ultimately unemployable pack behind me. Luckily with the arrival of red fish blue fish, the evening glowed to a start with Grisey’s Tempus ex Machina for six percussionists. Grisey, like his fellow spectralists, is interested less in specific notes than in sound phenomena as a whole and the cacophony of noise that oscillates and spins out when any kind of specific sound is produced to begin with. Thus bass drums, snares and gongs echoed one another in an often loud dialog that shimmered and rattled, creating a sort of warm language one usually doesn’t associate with these instruments. The six performers were stationed in various locations around the audience in the auditorium enhancing the effect. It was frankly quite remarkable. 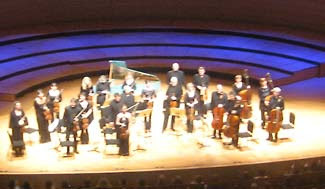 Afterwards, the Argento Chamber Ensemble under Michel Galante offered up the first part of Les Espaces Acoustiques, a piece structured in three sections that grows out of a 15 minute viola solo to progressively encompass ever larger numbers of performers until it reaches a chamber ensemble. (The second part continues to grow into a full orchestra.) In this hour long part, Grisey employs a similar strategy to that already described along with a handful of more humorous elements, including a riff on the sequence of notes most string players use to tune their instruments, a climax of rattled paper, a threatened (but never completed) cymbal crash and musicians noisily packing up their instruments. The beauty of Grisey’s writing comes from its recognition of the music inherent in all sounds. There’s something expected and rhythmic about all of this—like breathing. Or, better yet, like snowflakes with each phrase or passage remarkably similar to the last, but at the same time its own individual, distinct from all its forerunners. Leave it to the MEC organizers to put together yet another show of such high quality. Next up is a not-to-be missed organ recital from Charlemagne Palestine in March. 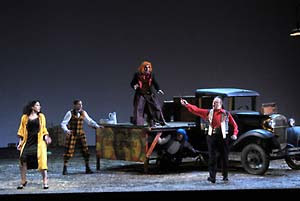 Lyric Opera of Chicago kicked off a very good revival of Cavalleria Rusticana and Pagliacci on Saturday. Here’s the big news – you don’t need to wait around for Dolora Zajick to show up in order to see it. The incomparable Zajick will appear in the final four performances of this run as Santuzza in March. And while she is undoubtedly worth catching, there’s an even bigger reason to see this double bill. His name is Valdimir Galouzine. The Russian tenor has been making an increasingly larger name for himself in this country over the last few years and starred in the Metropolitan Opera’s recent production of Prokofiev’s The Gambler to enthusiastic reviews. He's one of the big stars to come out of the Mariinsky Theater and he is now in Chicago as Canio in Pagliacci where he rages with all the pain and humiliation you could want in this role. 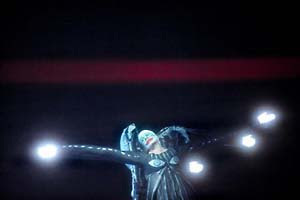 He’s powerful but still with vocal control and is a true star of the opera stage. The rest of the Pagliacci cast is excellent as well, including a beautiful and tortured Nedda from Ana Maria Martinez and the always superb Mark Delavan as Tonio. The setting has been updated to mid-20th century with a look straight out of Fellini's La Strada. A barren industrial landscape soon gives way to the garish neon colors of the carnival troupe complete with acrobats on stilts and jugglers. It's a powerful visual and one that lives up to its foreboding postscript as the final line goes to Tonio, as was Leoncavallo's original intention. As devastating as this Pagliacci was, it clearly outpaced its opening act. Renato Palumbo and the Lyric orchestra and chorus gave a wonderful reading of Macagni's score for Cavalleria. However, the other elements on stage struggled a little to live up to their standard. The staging is eye-catching; though, as conventional as can be. In fact, it's hard to believe that the same original director, Elijah Moshinsky, and design team responsible for such a gripping Pagliacci could have created such a timid and comparatively plain first half. The Santuzza in these opening performances was Guang Yang who seemed to hit all the notes, but got bogged down in the acting department. There's only so much hand-wringing one can do over the course of an evening, and she was clearly trying to see exactly where that limit was. The fact that much of this seemed to happen a good 20 feet or more from whomever she was singing to onstage made the disassociation even greater. Still, things could pick up as the run goes along and with such a strong second half, it's easy to forgive minor transgressions. The production runs through March 27. One other thing I caught in Chicago worth mentioning in the not-so-performing arts department was the new exhibit at the Art Institute entitled Becoming Edvard Munch, a major retrospective of the Norwegian painter and printer. It a bright and pointed show and, no, it does not contain “The Scream”. Well, at least not outside of a small woodcut print version of the iconic and oft-reproduced and lampooned painted image. This omission seems intentional in that the show goes to great effort to separate the artist from the manufactured image of him as a troubled man interested exclusively in the morose and dark side of human experience. Instead, Munch is grounded here as an artist highly integrated and influenced by his impressionist peers both inside and outside of Scandinavia. Not only did he produce works on themes more traditionally associated with his contemporaries, his focus on the melancholic also had multiple referents in the works of peers thought of as sunnier in their dispositions. Becoming Edvard Munch, which will run through April 26, incorporates many canvases from these peers from the Institute's own and other collections to demonstrate this relationship first hand and makes a compelling argument. Of course there is some risk to this. 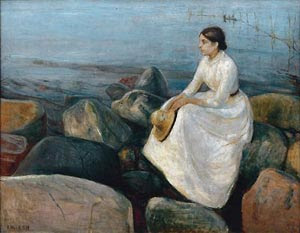 Suggesting that Munch was less an aesthetic loner than he is usually thought of suggests a not necessarily flattering opposite position – that Munch was more a follower than a leader, painting under the influence of themes and techniques that were currently popular or that he had picked up directly from others. The show points out the duality of most art, produced to meet both for aesthetic and commercially enriching objectives. The exhibit never suggests Munch was simply following trends simply for profit, but it is nonetheless true that one person's maverick is another’s lackey. Munch, of course, is neither one of these completely, but Becoming Edward Munch is successful largely on the ground that it confronts the very stereotypes we hold about one artist whose work may adorn dorm rooms across the U.S., but is by no means the dark and troubled soul some would like to imagine. Why are you avoiding me? I’m not such a bad guy and I’m a big fan. Really, I am. I know their are a lot of queens out there, opera and otherwise, who enjoy nothing more than writing clever little quips about your work, but I am not among them. I think you’ve gotten a bum rap lately and had wanted to set the record straight by seeing for myself in your current run of Tristan here in Chicago. Yet, it appears our paths are once again fated not to cross. Or at least not when you’re singing Isolde. (With Opera Pacific going belly-up last year, I won't be seeing you sing Salome anytime soon, either.) Tonight makes the second time in a year I’ve tried to see your take on Isolde and twice now I’ve had to settle for somebody else at the last minute. (Of course, I've had other, lesser performers do the same with Isolde in the last year.) Last March in New York, I caught the only show you didn’t make at all during the run and got to hear Janice Baird instead. So when I arrived in Chicago for the current run of Tristan only to discover your sub, Jennifer Wilson, in place, I was crestfallen. I’m sorry to hear that you’re not feeling well, though, and I do send all of my best wishes for a speedy recovery. How’d things go without you, you ask? Well not bad, but I wager it wasn't what it might have been otherwise. Wilson has a clear, bright tone and she was solid, particularly in the upper part of her range. I was feeling her Liebestod and I think that as her star continues to rise around the world she may become a more familiar quantity to me. She'll be showing up in L.A.'s Ring cycle next year, as well. I fear she may have been somewhat underpowered in the lower end, but she was a more-than-competent Isolde. Her acting skills were a little on the silent movie side, but I've seen far worse and many who looked more dead on stage than she did. Clifton Forbis, the Tristan, was a nice surprise as well. I saw him sing the role years ago in L.A. with some distress. But time apparently heals some things, and it looks like he’s grown into the role. He may have been a little pinched at the top, but I felt he strained less than I remember and I was rather taken with his stamina and acting commitment in the final act. The rest of the cast is good and it was the first performance in the run for Greer Grimsley as Kurwenal, who will finish out the run. The well-traveled David Hockney staging holds up and, even if you've seen it before elsewhere, it still works. It's been toned down a bit without the more controversial bits of the production such as the bit where Tristan originally stands after his death at the very end of the opera to encircle Isolde in his arms as she finishes her final note. But you can't have everything. Sir Andrew Davis is conducting, and, though I personally prefer a bit of a more deliberate and detailed approach to Wagner, the orchestra receives the biggest portion of the credit for this very successful evening overall. So, I hope you get well soon, Ms. Voigt. There are probably many people in Chicago who will get to hear you yet over the course of these performances, but sadly I won't be among them. Perhaps some other time. For those of you in town, this well-worth-seeing production runs for four more performances through February 28. Before taking off for Chicago this weekend, I drove down to Orange County to see Julia Fischer and The Academy of St. Martin in the Field on their current tour, which stopped in at the Segerstrom Concert Hall. I won’t go on about it other than to say all of the hype around Fischer is true. She was freaking amazing. 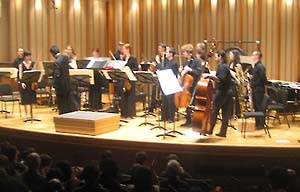 The program consisted of two works from 20th-century British composers, Britten’s Variations on a Theme of Frank Bridge and Walton’s Sonata for Strings. Under Fisher’s guidance, these two pieces were given full-blooded, dramatic readings that seemed much larger than the ensemble generating them. Sandwiched between these two works were two Bach violin concertos that Fischer played with a perfect touch. Straightforward without unnecessary or melodramatic over-reading, both pieces came off beautifully. Fischer’s attack was perfect – not too aggressive but not too reverent either. Her command of the proceedings was beyond question, and, I have to say, this is one of the more remarkable performances of these works I’ve heard in awhile. Fischer and the ensemble have just released a recording of the Concertos on Decca as well. All of this bodes especially well for her upcoming L.A. Philharmonic appearances which, based on this sampling, would be highly recommended. Don’t worry, you can go home again. Or at least you can if you're Danielle de Niese, the young soprano whose vocal career has been on an upward swing after a series of very well-received performances in mostly Baroque material including a hugely successful 2005 Glyndebourne performance as Cleopatra in Handel’s Gulio Cesare. As glamorous as that may sound, her debut recital appearance in Los Angeles was strictly old home week over at the newly-opened Broad Stage in Santa Monica. Another gift from art-loving philanthropist Eli Broad and his wife Edythe, the performance space, developed in conjunction with Santa Monica College, is a beautiful little room on the West side of town, perfect for just this kind of program. But given de Niese’s numerous connections to this city, where she grew up and attended school, the worldly beauty of the room seem subjugated to a kind of high-school-gym enthusiasm from the crowd, which de Niese clearly reciprocated seeing numerous family and friends in the audience. And frankly she deserves the adulation. Her warm and surprisingly sizable voice came bursting forth and she is no wall flower in the expressivity department. 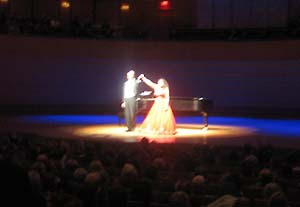 She kicked things off in familiar territory with two arias from Handel’s Semele, a part that would seem made for her. Playful and energetic she breezed through runs and trills with sheer joy. She moved on after this to a widely varied program including songs from Grieg, Wolf, Barber, Poulenc and Bizet. Perhaps the most intriguing to me were the Grieg songs. I’ve not been exposed to a whole lot of Norwegian singing outside of Prairie Home Companion, so her diction may well have been flawless for all I know, and she filled them with real drama and tension. If there were any real criticism of the evening, for me, it would be that I did feel she took a bit of an overly uniform line of attack. De Niese often seemed to be playing the vamp in these numbers in a highly accentuated dramatic style. As the evening wore on, I wished many times for some changes in tone allowing her to stretch muscles that required more subtlety or inward reflection. To this hometown crowd, though, she could clearly do no wrong. She wrapped up the evening with the same sly vixen approach with Cole Porter's "I Hate Men" from Kiss Me Kate. A little hard to believe, perhaps, but a nice end to the evening. Well, I suppose if you must, you could do worse than Minsky’s, the new musical from Bob Martin with music by Charles Strouse and lyrics by Susan Birkenhead. 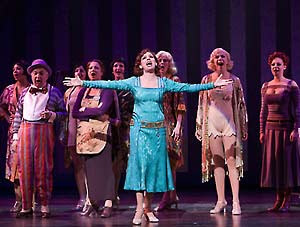 It debuted over this weekend at the Ahmanson Theater in downtown L.A. in a most eager-to-please fashion. (And it is certainly superior to the Ahmanson's other new musical Broadway contender this season, 9 to 5, that we were subjected to last fall.) Minsky's is set in a Lower East Side burlesque theater in the early 1930s and it deals with a litany of the most worn and cliché-ridden backstage scenarios. The unlucky theater proprietor, Billy Minsky, is at risk of losing his business due to the efforts of a prudish local politician whom he outwits while navigating a romance with the politician's daughter, a woman he has nothing in common with. Along the way are bright, hospitable musical numbers, with lots and lots of hoofing. It’s not poorly done, but it’s also never that enthralling either. The performances are quite good. Billy Minsky is played by Christopher Fitzgerald, recently of Young Frankenstein, and he’s able to keep the central character from becoming a complete cipher. The supporting women have an easier going with bigger results. Most entertaining is Bob Martin's Drowsy Chperone colleague Beth Leavel as Billy’s right-hand gal, Maisie. She’s got most of the emotional numbers—and the stage presence and chops to pull them off—putting more zing in the evening than anyone else. Then there is SNL alum Rachel Dratch as Beula, whose ineptitude and restricted affect become fodder for some of Minsky's genuine laughs. It's not unpleasant, but the whole never quite achieves the sum of its parts. Perhaps what irritated me most about the show, though, is the central theme that in the toughest of times, everyone needs a place to let their hair down and laugh. Not that this is necessarily a bad sentiment, but the show so relentlessly bludgeons the audience over the head with the idea and how prescient it is today that it borders on the intolerable. By presenting this 1930s story in a manner that defends the show's own existence in today's theater scene seems more depressing than heartening. Yes, we get the idea that times are bad without being told again and again how we badly need to make ourselves feel better about it. Still, I suppose some people might find this tuneful, though never quite memorable, show heartening on some level. If you don't find the idea of George Wendt in bad drag amusing, there is always the political angle. At one point, Billy Minsky asks his right-hand gal Maisie if it might not be better to forgo the burlesque business given the hard times. He asks if anyone with only two dollars to their name would want to spend one of them to sit in a hot theater and listen to old jokes. Maisie retorts that she would and that she would bring a friend. This exchange drew a spattering of hearty applause from the balcony when I saw it on Sunday night, which seemed appropriate given that just last Friday the U.S. Senate voted overwhelmingly to prevent any of the bailout funds that President Obama has recommended from going to any arts organizations. Apparently the arts aren't stimulating enough in an economic sense in these difficult times. Sadly, while Minsky's may be an old trope, some people still haven’t got the message yet. On the more properly deserving side of things, Esa-Pekka Salonen leading the Swedish Radio Symphony Orchestra and Hilary Hahn won in the Best Instrumental Performance with Orchestra category for her bang-up recording of the Sibelius and Schoenberg violin concertos. Without orchestra, Gloria Cheng took home the Best Instrumental Performance award for works by Salonen, Stucky and Lutoslawski. This week was all about polish. And that's a good thing, even if it isn’t always for the best in every situation. 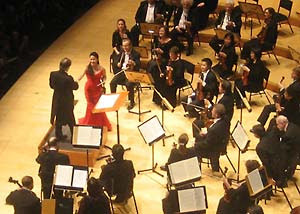 The venue, of course, was the Walt Disney Concert Hall where the L.A. Philharmonic hosted conductor Charles Dutoit and rising star Yuja Wang on piano. Based on these performances, this would seem a match made in heaven. Dutoit is an old master, and there are few that can match his ability to go so far with so light a touch. Thursday night’s program included the very French Debussy’s Petite Suite and the less so Scheherazade of Rimsky-Korsakov. In Dutoit’s hands these works sparkled with smooth, warm, and fragile surfaces, in performances that were nothing if not admirable. Concertmaster Martin Chalifour got to shine in the solo bits of the latter and I do admit I was taken up with all of this overall. Wang is a kindred spirit to Dutoit and gave two rather well honed performances of her own this week. 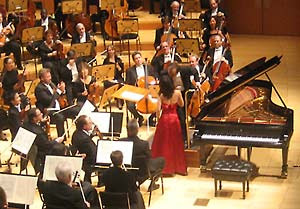 With the Philharmonic, she assailed Prokofiev’s 2nd Piano Concerto with amazing technical prowess and command. Again admirable and well received, but the Prokofiev is a stranger fish than the other works on the evening's program, and, for all of it’s rough edges, I wasn’t sure how much Prokofiev's difficult score benefited from the energetic but ultimately restrained approach. I wished for something more maniacal, more drastic in the offing here. Still, Wang’s talent is undeniable and Tuesday’s performance of Franck’s Piano Quintet in F minor with members of the L.A. Philharmonic had moments of beauty as straightforward as breathing – simple, clear, and unassailable. Wang will undoubtedly be popping up again, and that is very good news. So the history of the Franco-Russian camaraderie in music at least carries on. It may not always be a perfectly harmonious one, but this weekend proves it continues to have a wealth of rewards. 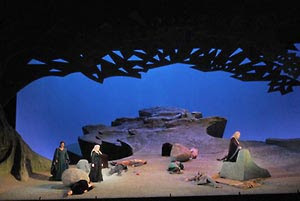 Los Angeles Opera has announced that it will reprise its community performance of Benjamin Britten’s Noah’s Flood, first seen in 2007,on this coming March 7th. There will be two performances at 4 and 7 pm and as before tickets are free (with a 1 dollar handling fee per order) and the show will take place at the magnificent Our Lady of the Angels Cathedral across from the Music Center downtown. Tickets are available tomorrow February 6 at 10 AM either online or by phone directly through LA Opera. It was a great show last time and it’s a perfect excuse to see the Cathedral if you haven’t had a chance. If you go, get there early: these events will tend to be at overflow capacity and parking in the Cathedral will likely fill well before the start of the program. Although the UCLA Live International Theater Festival wrapped up in December, the spring season by LA’s premiere performing arts series on the west side is picking up with a number of exciting dance events that are worth seeing including Batsheva Dance Company on Feb 28 and 29, flamenco legends Los Farruco on March 3 and 4, David Roussève and REALITY on April 1-4, and Ballet Preljocaj on May 1 and 2. It’s a nice variety of dance performances, and to start things off tonight, Royce Hall hosted the Guillermina Quiroga Dance Company. Quiroga’s much-lauded career as a tango performer and choreographer takes new focus here with her own company performing her work Tango, Historias Breves. It is no surprise that the dancing in the two-hour evening is excellent. What is a surprise is how visually enticing the whole show is throughout. Historias consists of three quasi-narrative vignettes that deal with topics that jive well with the tango’s themes of relationships between men and women. However, these “brief stories” only make up about half of the evening which is also populated with musical interludes from Cuarteto Cacho Acuna as well as various smaller scale performances from various dancers of Quiroga’s 8-member troupe. All of this takes place on a large empty stage lit in a colorful and moody fashion that creates an intensely David Lynch vibe to the whole evening. Decidedly more Mulholland Drive than Twin Peaks but with an undeniable air that is both inviting and simultaneously foreboding. It’s a strong visual tone and one that sets off the physical performances of the dancers well. Perhaps the only exception to this, is the brief comic relief wedding sequence midway through the second act that more overtly references a 20s screwball comedy. The narratives of the “brief stories” are not always the clearest or most compelling, but they’re also not so obtrusive that they ruin everything. The choreography throughout is what one would expect from Quiroga, who has been involved in bringing tango performances to much larger audiences around the world—it has a broader scope and style than some purists might prefer. Still, the influence is undeniable and there’s more than a little fancy footwork and intertwining legs throughout. It’s worth seeing and you’re in luck that there’s a second performance on Thursday Feb 5. In the meantime, if you want a clearer idea of what I’m talking about, check out the clip above of Quiroga in action with Roberto Reis. Two works that deal with the past in rather different ways are currently on offer by Los Angeles’ Center Theater Group. While both have their successes that could recommend them to some, neither is completely satisfying. The bigger of the two is a revival of Hirson and Schwartz’ Pippin at the Mark Taper Forum produced in conjunction with L.A.’s own Deaf West Theater. CTG and Deaf West by now have a long and fruitful history dating back nearly a decade to Big River and more recently with the kid-oriented Sleeping Beauty Wakes. 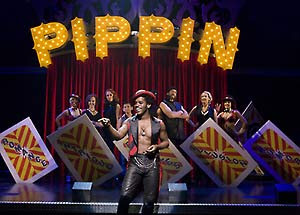 Pippin does nothing to diminish the quality one might expect from this history in a show that cleverly combines both deaf and hearing performers and is delivered simultaneously in two languages. The show is big and bright with excellent production values, although the amplification was rather rocky in the performance I saw. The principals are mostly good, but the one standout is Ty Taylor as the Leading Player. Taylor is another performer minted out of TV’s reality show contest craze, having won that INXS lead singer competition thingy whenever that was. But such an inauspicious credit belies his talent and performance history. He’s magnetic and vocally strong generating the majority of moments where the production really comes alive. So with all this positive stuff, why isn’t the revival a huge artistic success? Mostly, it’s the dated and dull material. People may want escapism these days, but I’m not sure arriving in an adolescent’s memory of the 1970s is what they had in mind. The edgeless, and nearly plotless Pippin, is too well meaning and too unfocused to generate interest outside of a few of the musical numbers. Maybe I’m wrong, though. Hey, if Hair can stand a major revival, why not Pippin? Maybe this particular production just isn’t the one. Meanwhile, across town at the Kirk Douglas Theater, CTG is presenting an artist dealing with the past of his own neighborhood. Danny Hoch’s Taking Over is a solo show detailing the ills of gentrification in the actor’s own Williamsburg district of Brooklyn through a series of character monologues. The piece has received a fair amount of attention for being unsettling to the middle-class, typically white, audiences it has played for around the country as well as in New York due to a confrontational stance towards those who might not view such developments as problematic. The funny thing is that Taking Over is actually quite timid throughout with rather sweet and funny vignettes and little outside of the very worn and beaten path of numerous other solo shows in recent years. A funny hat, a diffent coat, a well-practiced accent and boom - you've got a show. In fact, however, Taking Over only becomes confrontational when Mr. Hoch himself tells us that it is confrontational despite all evidence to the contrary in a penultimate scene where he steps out of character to read negative reactions to the work from former audience members and discuss his own feelings and experiences that informed the project to begin with. Apparently some people are uncomfortable by the thought that gentrification has a down side, but if this is a majority of his audience, Mr. Hoch appears to draw many a theatergoer who has never heard of Harold Pinter much less Sarah Kane. I suppose dressing this sheep in wolf’s clothing is clever marketing, but sadly it is not necessarily very compelling theater. There are a number of very good bits here that are funny and Hoch is adept at characterization, but this is not new stuff and its been done with more flair. (Even as recently as Nilaja Sun‘s No Child… in 2007 or Roger Guenvuer Smith’s The Watts Towers Project in 2006, both at the Kirk Douglas.) There are some clever ideas here, though, like the role that self-hatred plays in further oppressing the colonized that could perhaps be better served if realized in a more challenging setting. But, in the meantime, if you like this kind of solo show, I wouldn’t imagine you being disappointed with Taking Over, which runs through February 22nd.